Title How Wikipedia Works: And How You Can Be a Part of It? In this book, you'll learn the skills required to use and contribute to the world's largest reference work-like what constitutes good writing and research and how to work with images and templates. Phoebe Ayers (user:phoebe) is a science and engineering reference librarian at the University of California, Davis. She has been involved with Wikipedia since 2003 and is an organizer of the Wikimania conferences. 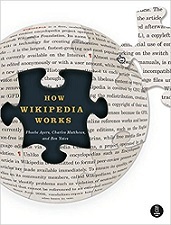 Charles Matthews is a Wikipedian in the U.K.
Ben Yates was a Wikipedian from Michigan; he was the illustrator of the book.